First Black Friday 2015 deals from Aéropostale is here. Get $10 cash card when you spend $40 or more at U.S. Aéropostale stores. It is possible to redeem the card between 11/26/2015 and 11/29/2015. 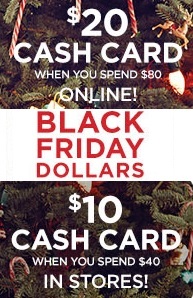 Or, get $20 online cash card when you spend $80 or more, valid online only. You can redeem it online between 11/26/2015 and 11/29/2015. Source of the information is Aéropostale. More details about the deal at stores or online.